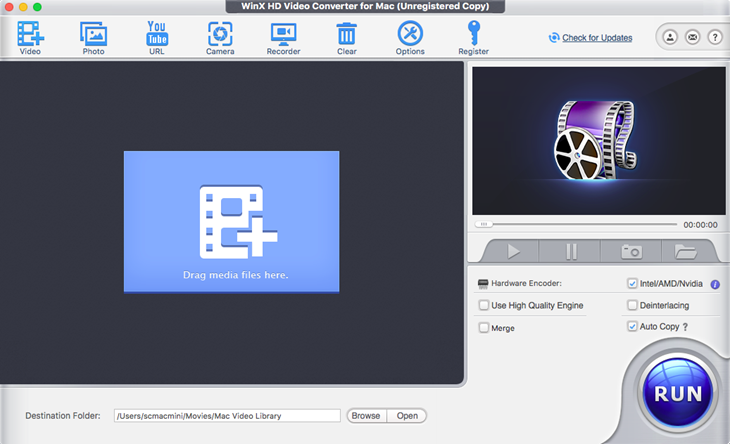 Download and convert 4K/HD videos to fit Mac iPhone iPad at fastest speed. 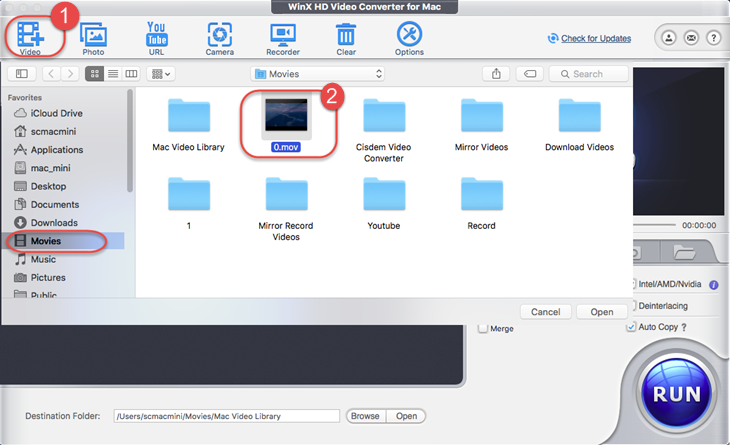 Download online videos from 300+ sites on your Mac! 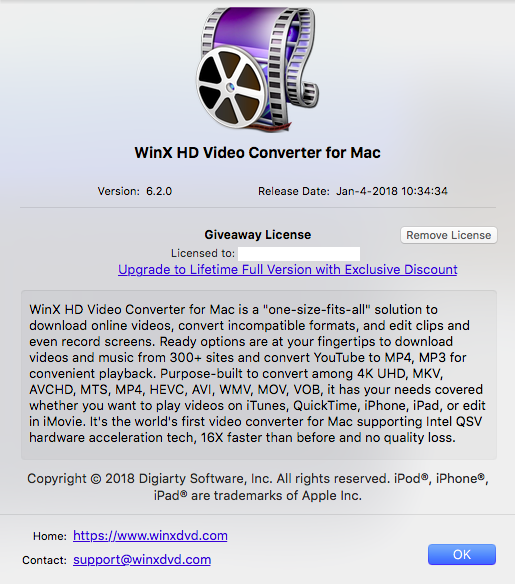 Download the DMG file of WinX HD Video Converter for Mac. 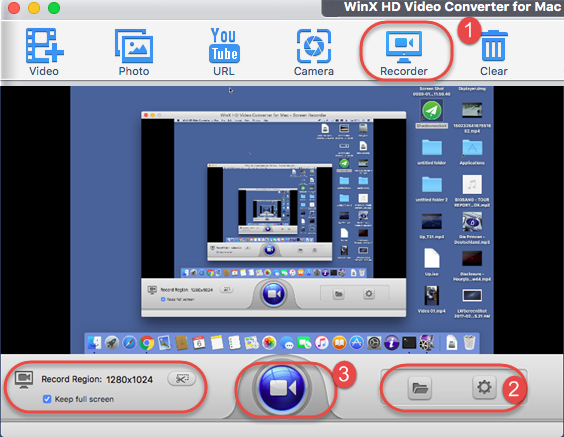 1 Open the "Downloads" folder, double click "winx-hd-video-converter-for-mac.dmg". 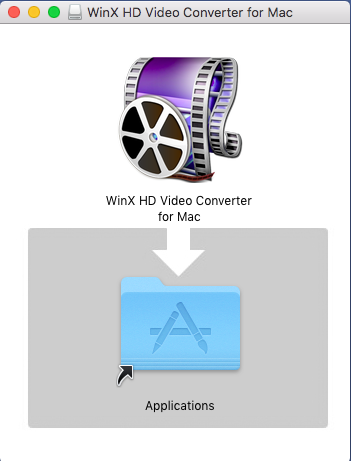 2 Drag and drop WinX HD Video Converter for Mac into the Applications folder. 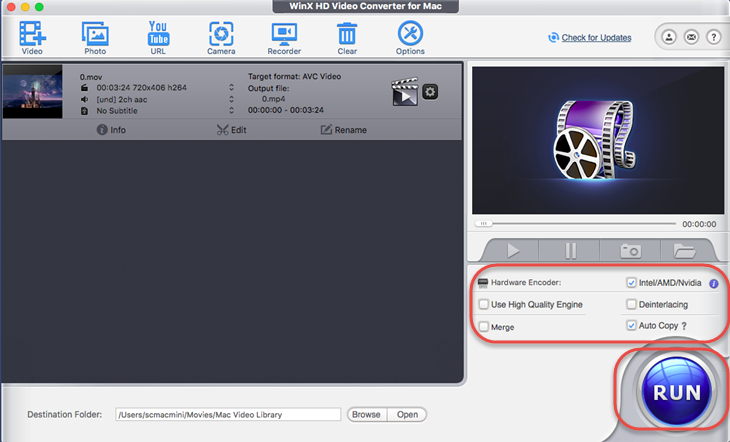 3 After installing, run WinX HD Video Converter for Mac. 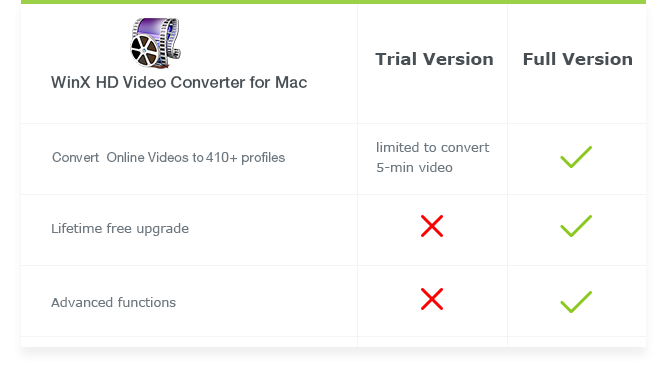 1 Trial version is limited to 5 minutes during video-converting. 2 Free update to the latest full version is unavailable. 3 No advanced features are not provided. ※ Tips: The 5-min trial limit can be removed by upgrading to the full version, which will constantly upgrade to the latest and offer technical support. 1: Click "Buy Now" below to buy the product from our official purchase page. 2: Or click "Register" and click "Buy Now" button. ※ The full version activation info will be sent to your email once you complete the order. 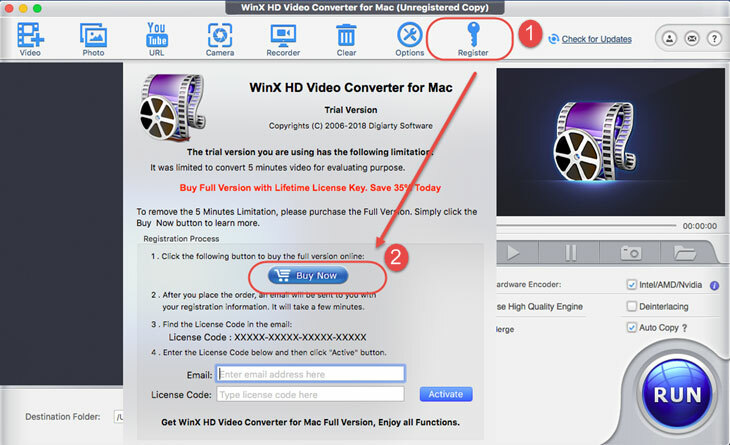 1 Open WinX HD Video Converter for Mac, click "Register" button. 2 Input your "Email" and "License Code". 3 Click "Activate" to complete the registration process. ※"Email" refers to the mail address you used to buy/obtain this software. ※ There are no spaces in the license code field. It's highly recommended to copy & paste your code to avoid any typos. ※ Please make sure you have proper Internet connection when registering WinX program. 4 You will see a pop-up window confirming that you have registered successfully. 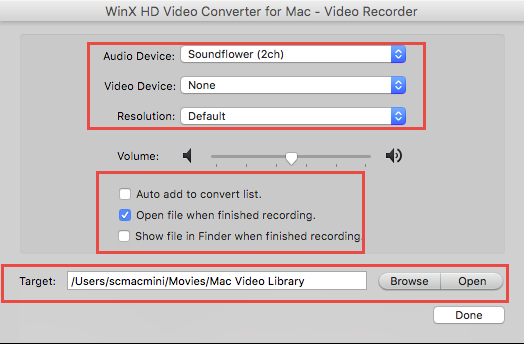 Open WinX HD Video Converter for Mac, then you can easily convert video in 3 steps: Add Your Video ＞ Select Output Format ＞ Start the Conversion. 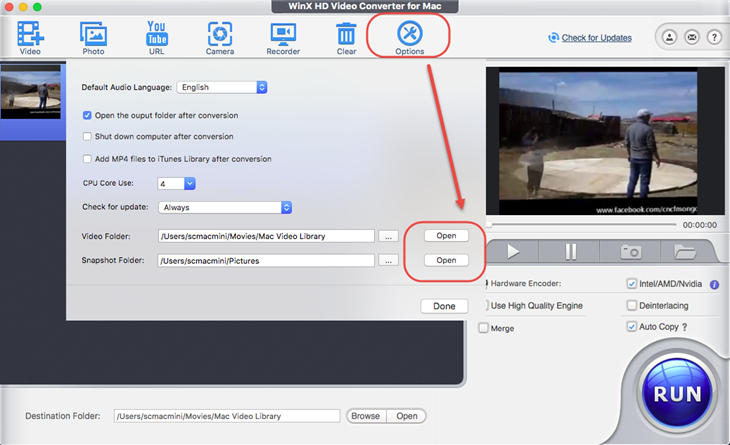 You can add your video files by clicking "+ Video", or simply drag & drop files to the program. 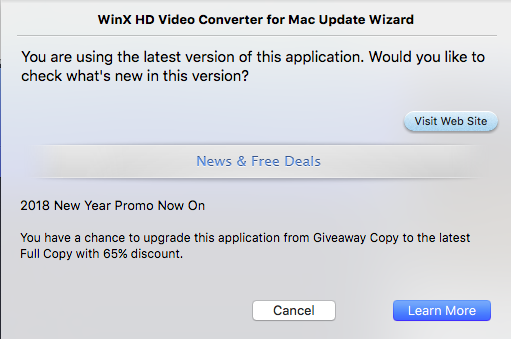 Then, double click the video you select. 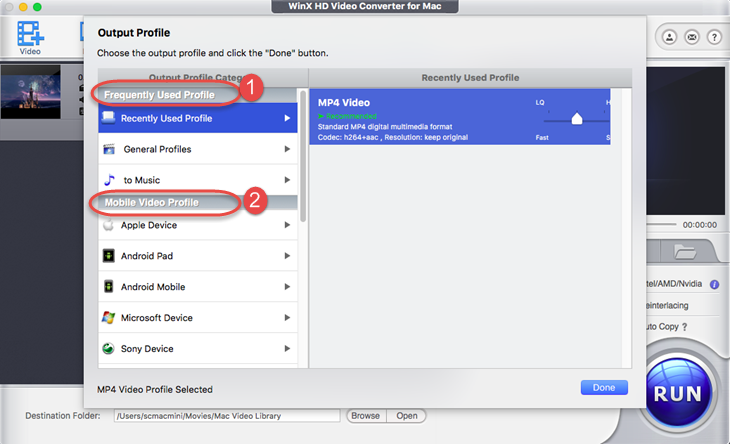 Once you select the target video, it will pop up an "Output Profile" window. You can choose your desired format or device from the list of preset profiles. You'll find output formats that are commonly used here. 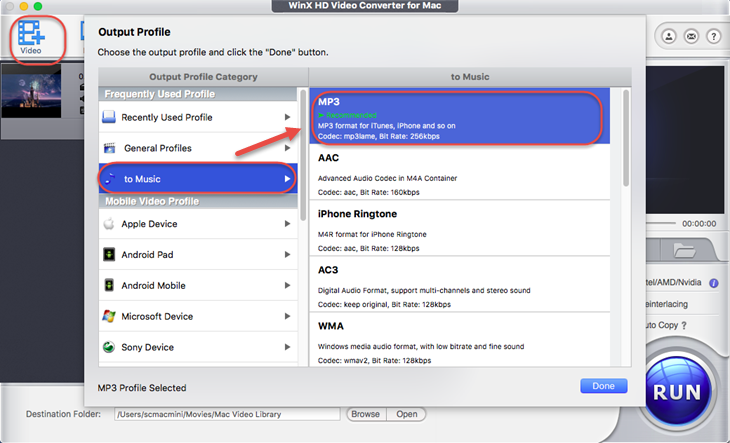 Also, if you want to convert the video to music only, there are quite a few audio formats you can choose, such as MP3, AAC, AC3 and WMA. In this part, you can easily find your mobile devices. 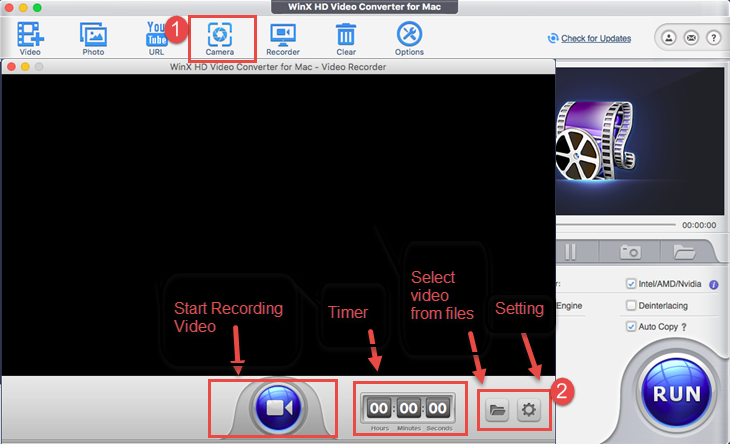 Convert video for playback on iPhone, iPad, Android Pad/Mobile, Microsoft, Sony and other devices. Transcode video to YouTube, Facebook, Vimeo and other general web video for different formats respectively. or to TS/MTS/WMV HD Video as you want. Select your desired preset profile with original resolution, and click "Done". 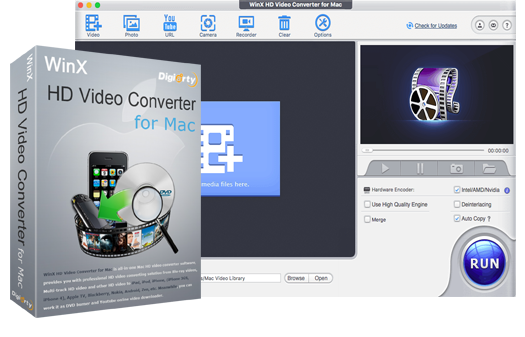 ※ This video converter for Mac lets you upscale 2K/1080P videos to 4K and downscale 4k to lower resolution at fast speed. (Optional) Press "Browse" and change the location where you want to save the converted file. After that, hit "RUN" in the lower-right corner to start the conversion. 1 Enable "Intel" or "Nvidia" accordingly to improve the video converting speed. 2 Turn on "Use High Quality Engine"for better image quality. 3 Set "Deinterlacing" if your video source is an interleaving video. 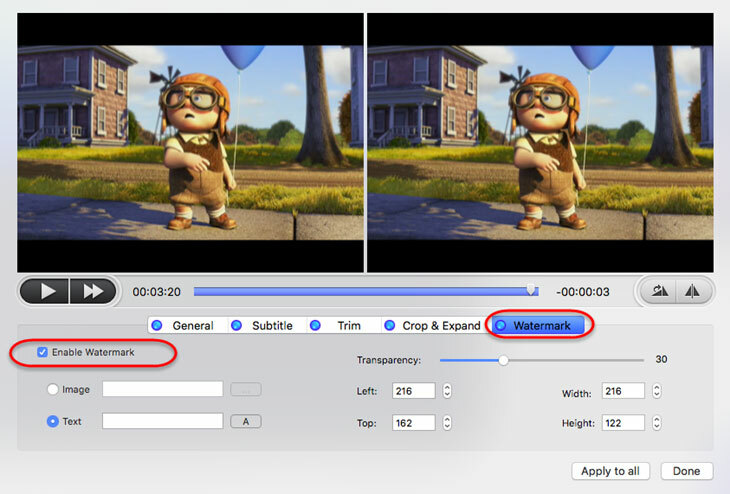 4 Import all clips you want to put together, and click "Merge"to combine them into one. 5 Click "Auto Copy" if the output video codec files are the same with the input. Integrated with edit features, WinX HD Video Converter for Mac lets you make your own creation in minutes. Click "Edit" button to pop up the edit window. Check "General" -> Drag the bar to adjust volume -> "Done". "Apply to All": apply changes to all videos you added. 1 Unfold "Enable Subtitle" -> Select the Built-In subtitle -> "Done". 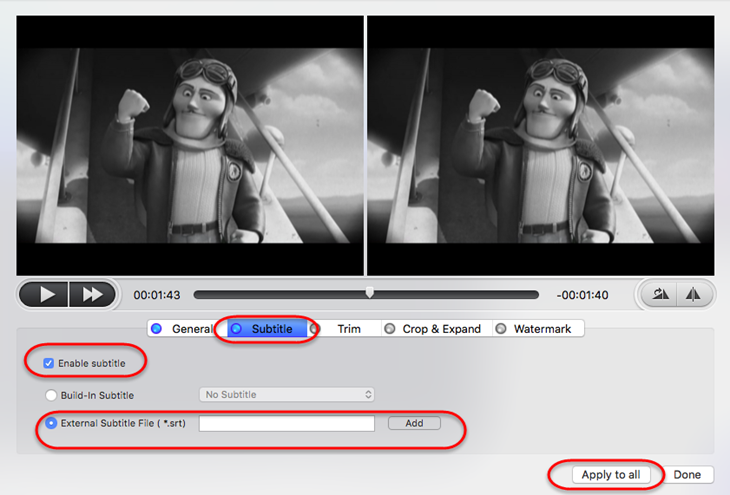 2 Unfold "Enable Subtitle" -> "External Subtitle Files " ->Click "Add" to import SRT subtitle file -> "Done". Crop and expand your video to fulfill the screen or devices. Crop Presets: it has 7 presets - Free, Keep Current, Keep Original, Crop letterBox, 16:9, 4:3 and 1:1. Position: Set boundary from left and top with pixel. Size: The resolution of video/image. 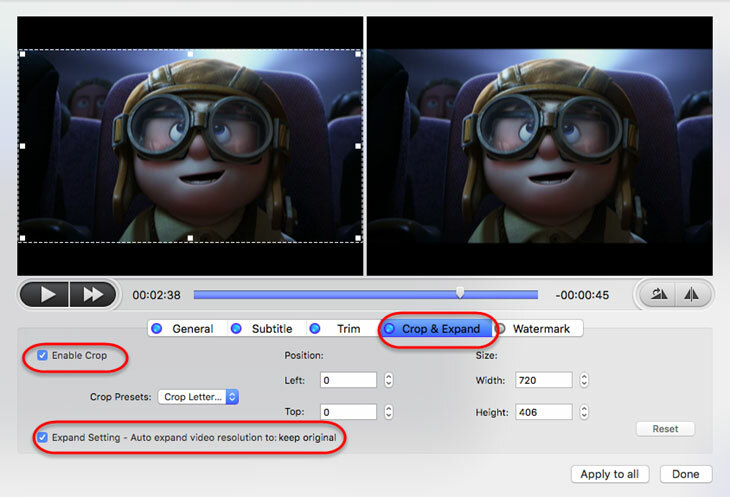 ② Expand: Auto expand video resolution to keep original. Tap "Trim" button to cut video files to a smaller clip. 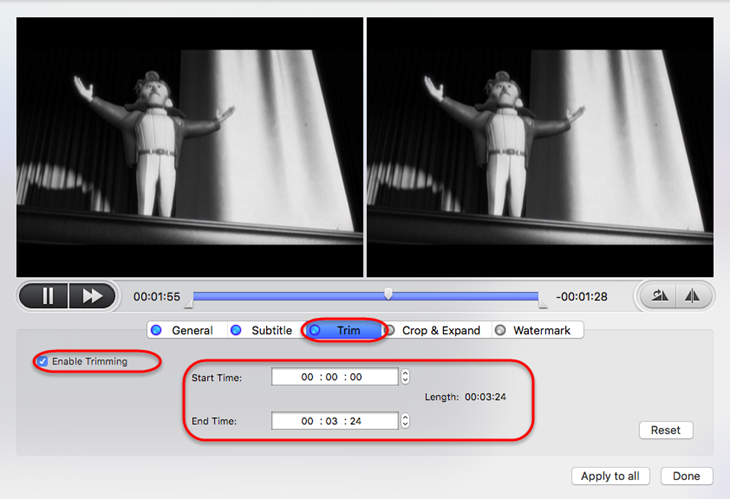 Check "Enable Trimming" to set any time point of the footage as Start Time and End Time. * Also, you can just drag the slider to select a segment you need. Adjust the parameters about "Left" ," Width", "Top", and "Height" by clicking the right bars, you may keep the default numbers as they are. 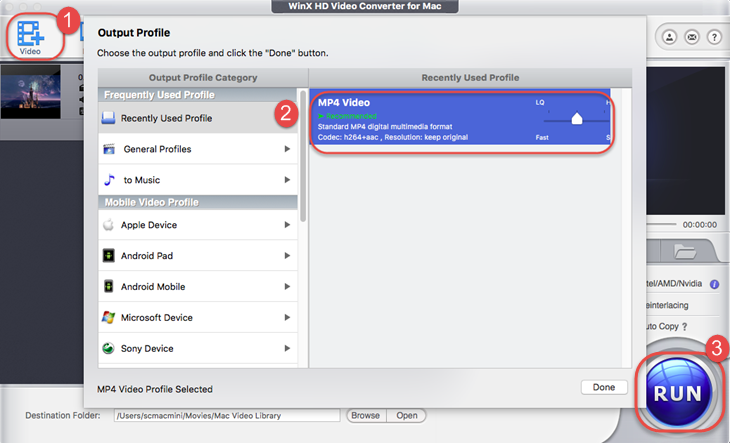 Open HD Video Converter, click "YouTube URL" in the toolbar. Visit YouTube, Facebook or other video sharing sites in browser, copy the URL of your desired videos, including 4K/1080P/720P video. 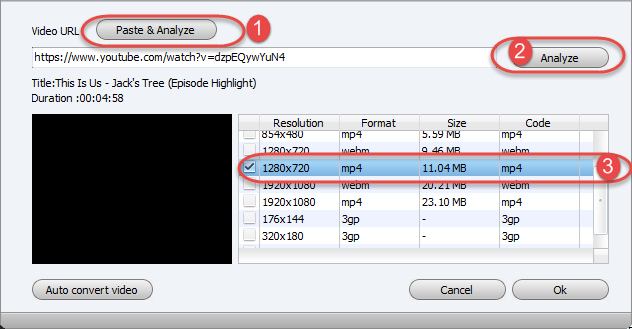 Click "Paste & Analyze" and HD Video Converter starts analyzing. Then you can select the format and resolution and tap "OK". Tap "Download Now " button to start downloading. If you want to download videos in batch, add all your video links to the program and Video Converter will download them one by one. First of all, gather all of your photos in a folder in order. 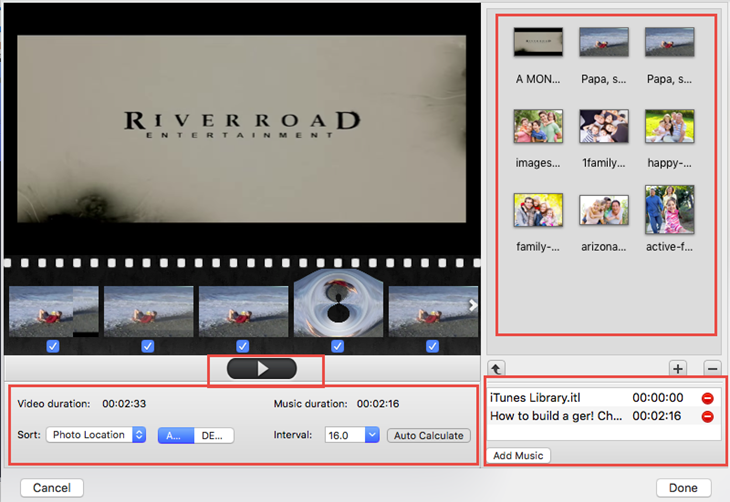 Then click "Photo", choose a video format and hit "RUN". You can also add music to your photo slideshow easily. 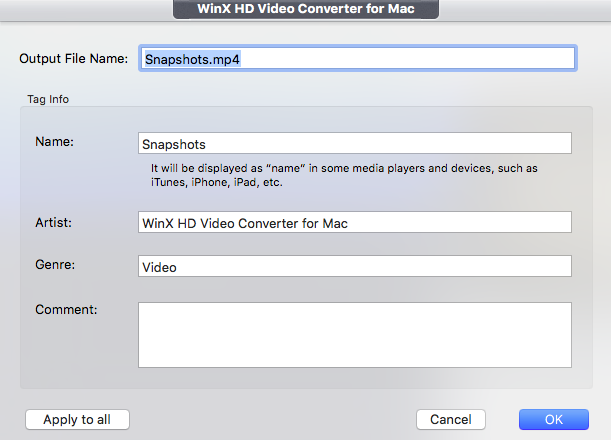 Launch WinX HD Video Converter for Mac, tap "Photo" in the toolbar. Then choose a photo album folder in the "pictures" category. Click the folder then tap "Open", all your photos in that folder are loaded directly. 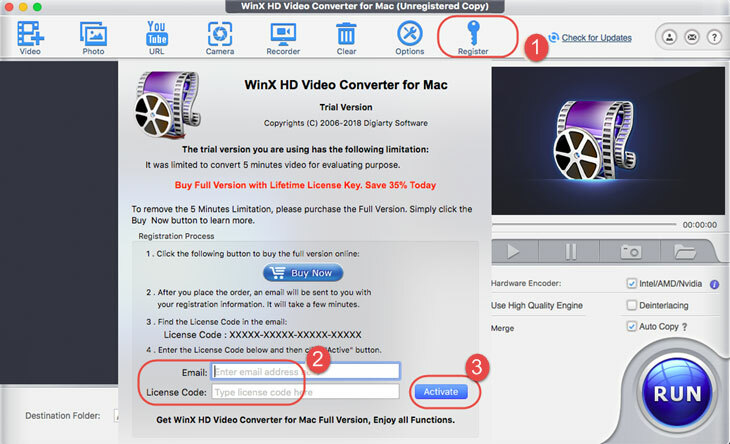 ※ WinX HD Video Converter fully supports JPG, JPEG, PNG and BMP image format. From the pop-up window, select your preferred format and click "Done" to go ahead. Click "Edit" to customize the photo slideshow with background music and more. 1 Click to play video; tap to stop. 2 In lower left corner, you can sort the photos by "Photo Location", "Creation Date" and "File Name" in "ASC"(ascending) or "DESC"(descending) order. Also, you can choose 2/4/6/8 seconds from "Interval" or tap "Auto Calculate" to alter the interval between two pictures to match the "Video Duration" with "Music Duration". 3 At the top-right corner of the window, click " " to import more photo file folders or tap " " to remove one. 4 Click "Add Music" to import music file; tap to remove. After adjusting your slideshow, click "Done" to proceed. Just click "RUN" button to create the slideshow. 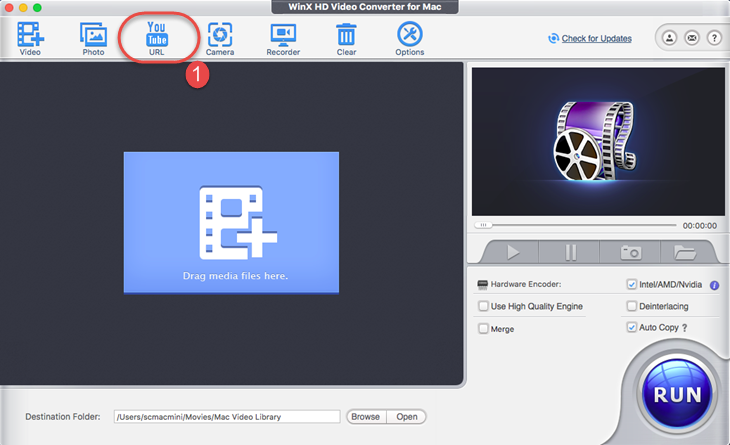 In this part, you can make your own video on the spot then convert and edit it. 1 Click the "Camera" in the main interface, then the recording video pops up. 2 You can tap the " " to set the recording preperences, such as audio and video device and volume, then click "done" . 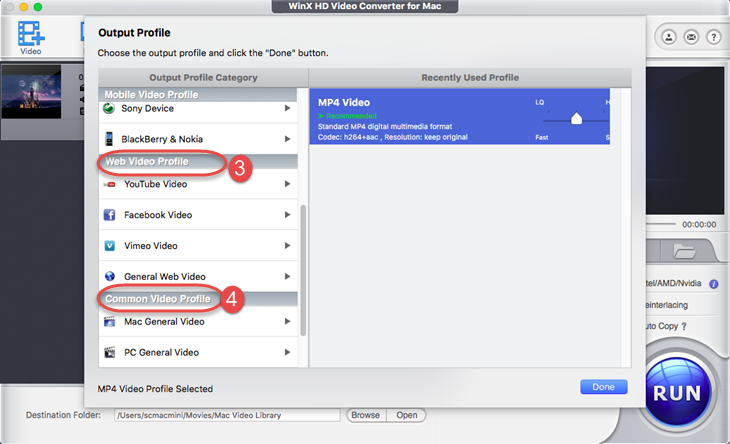 3 Click the " "to start or stop recording your own video through your front camera in Mac. 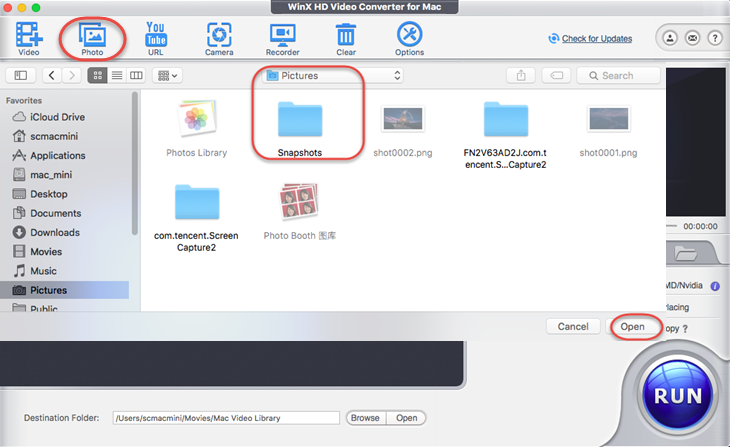 In this section, every move on and before the Mac screen can be recorded with the embedded Screen Recorder. 1 Choose "Recorder" on the main interface first. In the bottom left, keeping full screen and record region is set defaultly while you may change as you like. 3. 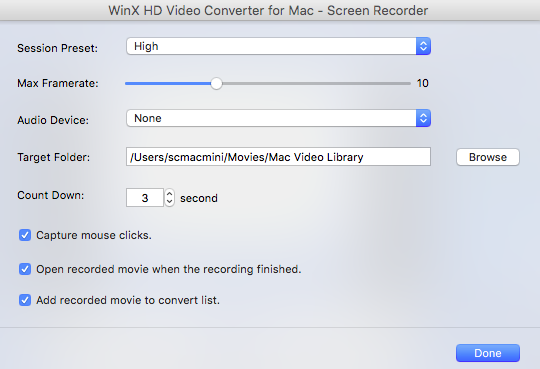 Just click the " " to start recording your Mac screen. It's quite simple if you want to make computer or game tutorials. 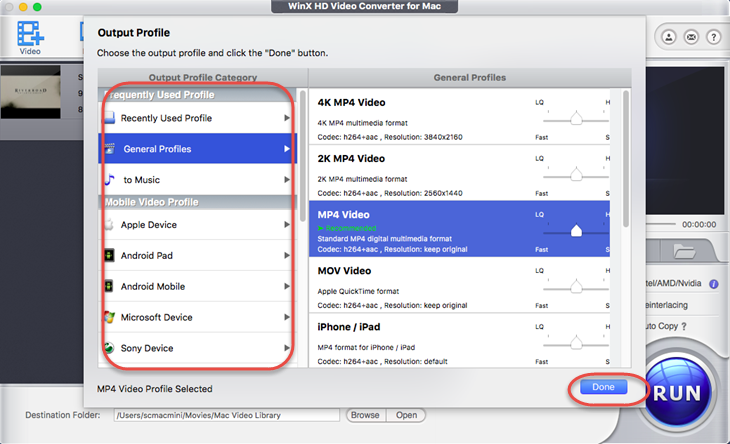 Here you can learn general preferences of the program and advanced settings of output video. Click to remove all sources you added in the program. Click to customize default audio language, CPU Core Use, output/snapshot folder and etc. You can find detailed information about the product in the upper-right corner of user interface. 1 : Click to check the latest version information and upgrade. 2 You will find product information like Version No., Built date, Registration Status, etc. 3 : Click it to drop us a line if you have any question or suggestion. 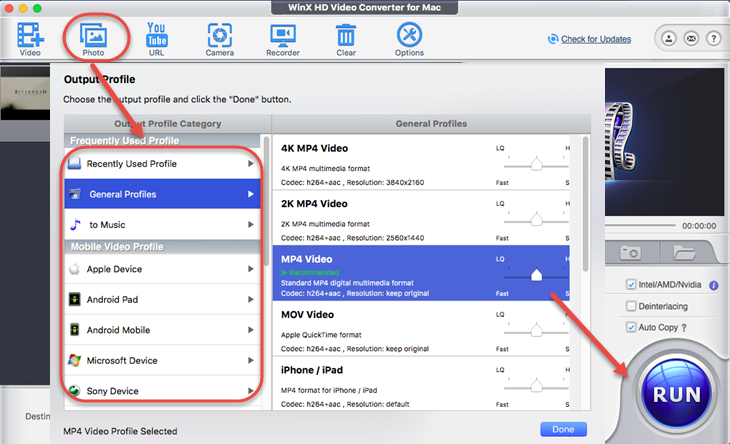 4 : Click to open the user guide of WinX HD Video Converter for Mac. Learn how to customize output settings here. 1 : Open this gear icon to balance the output quality and file size. 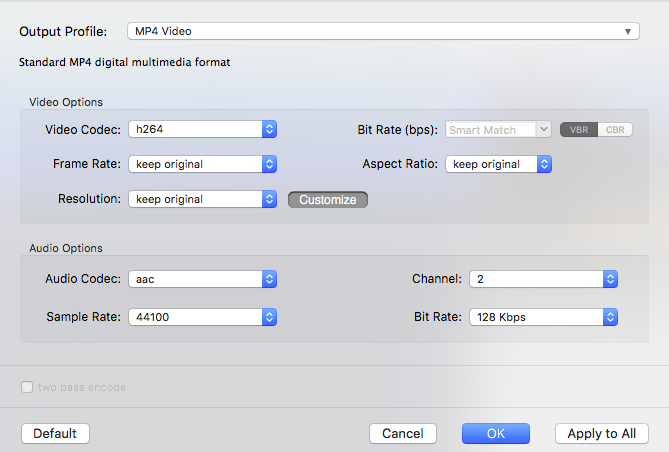 You can customize video audio codec, bitrate, frame rate, aspect ratio, resolution, audio codec, audio channel number, sample rate, etc. * Click "Default" to restore to initial state. 2 : Change the output profile directly. 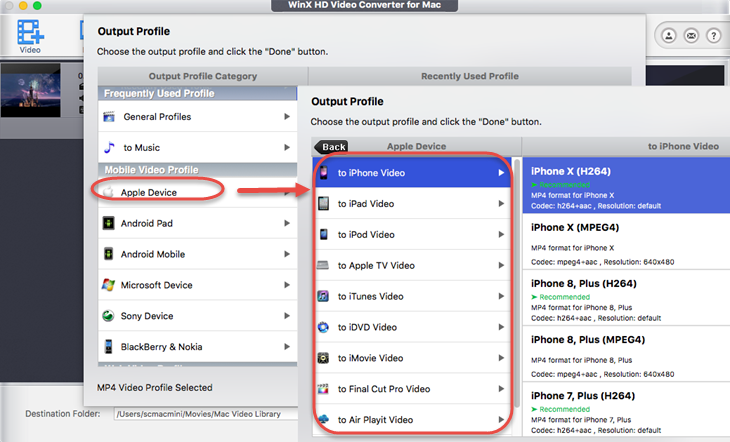 3 : Rename output file for proper display on iPhone, iPad, Apple TV and other devices. 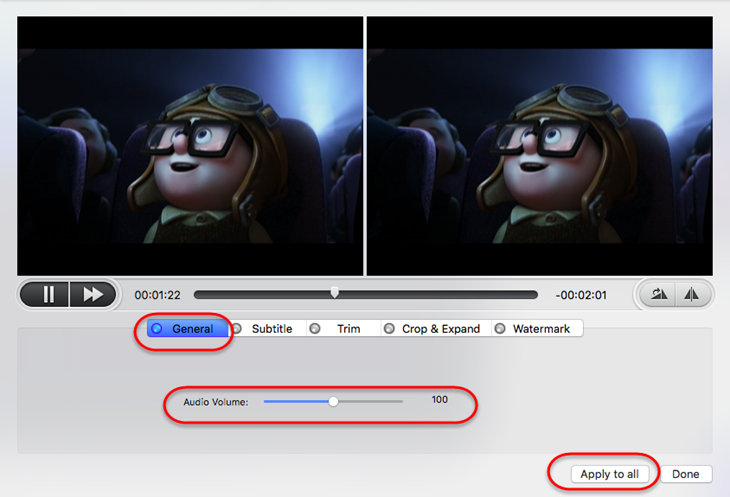 4 : Click "Edit" to adjust volume, trim or expand & corp video, add watermark and so on. 5. :Here shows the informations of this loaded video. 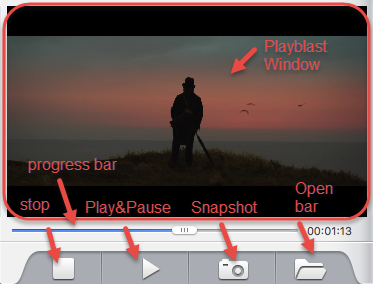 Preview Window is composed of Playblast Window, Progress Bar, Stop, Play & Pause, Snapshot and Open Bar buttons. Click snapshot button to take picture appearing in the video and store as PNG.